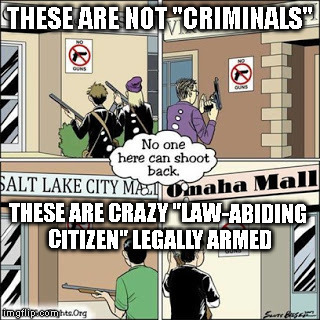 Once they carry a firearm into a gun free zone, they are criminals, so how are they "Law Abiding"? You're assuming that every a gun owner is a member of the NRA... AND the NRA is an organization, not a business. They have members, not customers. It is funny, this guy thinks the US is anything like France. He is not even American and he is dictating to us whether we should be able to own a gun or not. You are correct; I express myself wrong. I point NRA cause I think they are the main obstacle to any change concerning the guns in the US. They are spreading the false idea of "Law-abiding citizen VS Criminals". It is a childish black or white vision. I don't say that every gun owner is a murderer, but it is a potential one as it own a very easy to kill weapon. When you are sad, angry, when you have been cheated by other, etc... In all those cases that can cause depression you become dangerous with a gun. Lets say you get drunk other that and voilà you are in the street with your gun. Same thing with suicide, a bullet in the mouth is easy painless and fast. Other way to kill yourself gives you more chances your mind. Real criminals exists in every countries. The police deals with it. Not the citizen. The result of that 'controlled gun' system is that those countries have much much less dead by gun. Just look at this video of a bad day in the US. In France if 1 person dies by gun, the speak of it in the national news. I'm not sure if americans realise how shocking to the rest of the world this number of dead citizen is. You are uesed to it, you should not. Of course we had some terrorist attacks in France, made by international terrorist groups. But we let the police and the army deal with it. They are not perfect but do a great job. Plus they only have to focus on those terrorist groups when it comes to mass murder. In the US it is law that military can not act against its citizens, that is what the numerous law enforcement agencies are for. But they are still a reactionary force. What better what to stop a deadly criminal episode than to put bullets on the bad guy as soon as possible? And does it really matter who it is that stops the deadly activity? And if it does, then all the extra people that die in the time while waiting for who you think should deal with it, to respond is acceptable? You can keep your laws in France and I'll stick with my pistol and right to self defense in my country. Letting citizen try to self defend lead directly to the number of dead by gun that you have. Robbers like most of the criminals are not after your life but your money. Robbers get the money of the banks of shot and go. But if some try to self defend ans play heroes they turn the situation into a shooting. Also Vegas is the perfect example of how powerless your armed country is. Vegas police is well equipped, some people had guns. The result was the same has the Bataclan. Any crowded street with a window is all it takes. So you can keep arming teacher or anyone, it will NOT solve the PROBLEM. The best thing you can do is praying then. And that is what you have been doing for a lot of mass shooting now. In France the terrorist attacked have stopped and the mass shooting by civilians are still non existent. Those are caricatures of the criminal depicting them in from of where they committed their crimes. So, how are they "law abiding"? Try learning some history sometime. The template for your meme is depicting specific events with specific people in each image. Why do you think there are two individuals in the top left image? And the NRA doesn't have customers because they do not sell a product, the NRA has supporters. I have the reference for the picture. Mass murder committed by regular folks owning guns legally and who wanted there suicide to be remembered. They were not just elaborate suicides, they had an agenda to cause chaos brought on by targeted murders supplemented by murders of opportunity. And did you ever think the laws are they was they are because the government is run by people who are representing their constituents. Just look at the number of firearm owners in the country and that paints a pretty clear picture of how many numbers are in that corner.